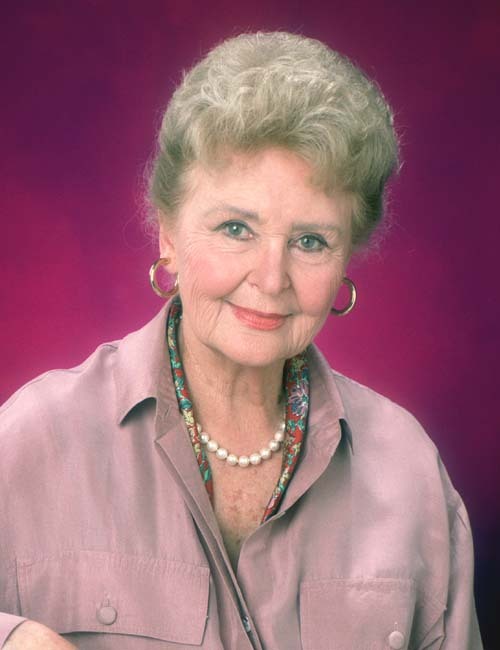 As of this posting, the media has not quite caught on, but I have learned from numerous sources on Twitter and We Love Soaps.com that Frances Reid, who played the role of Alice Horton on “Days of our Lives” from the show’s début in 1964 until the present, has died at age 95. Frances was not just any ordinary actress. She had the warmth of a grandmother and everyone loved her so very much, simply because of the character she played, day in and day out, on television. On TV, she was grandmother, great-grandmother, and even great-great-grandmother to dozens of family members. In real life, she was grandmother to millions. As far back as I can remember, I recall my Mom and my Grandma watching Days of our Lives, and I remember seeing this radiant woman on the screen and I always knew I’d like her. She reminded me of my Grandma in many ways. As I grew, and I started watching “Days” with my family, I enjoyed her adventures with Bo and Hope, her wise advice and drugged donuts (remember that? ), and her love of her Tom and her family. As it turned out, she truly was everything I thought she was when I first saw her as a little kid. We watched her as her kids grew up, and had kids, and moved away. We watched her and cried with her when Tom Horton died (when Macdonald Carey died), and we watched her grow old and frail, but still with that sparkle in her eye. We knew she’d be leaving us soon, but the loss still hurts deeply. She lived a wonderful, rich and amazing life. I’ll always remember her. I think I’ll get some powdered donuts today to celebrate her memory. Next postWith a Whoosh and a Schuss!